Ram sets the tone for the ultimate workhorse and the 1500 fills that position well. 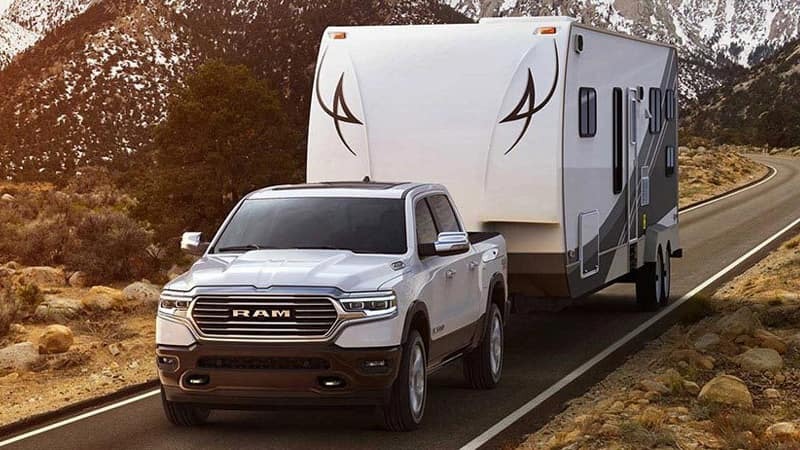 It provides excellent towing and payload capacity making job sites so much easier to manage and on the weekend, it transforms into the ideal truck for road trips. 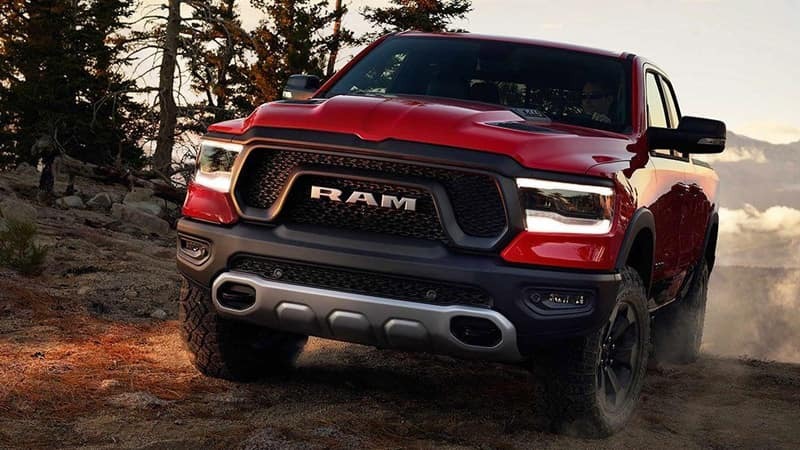 The 2019 Ram 1500 is a great in-betweener for those who need to get the job done at the right price. Six trims make up to 1500 fleet and drivers have access to some of the most interesting exterior design features. A lot of detail went into each trim, as each features a different grille and a few other design tweaks. The base model in the fleet is the Tradesman and is the ideal fit for those who need a strong workhorse with great towing capacity. Other trims in the range include the Big Horn/Lone Star, Rebel, Laramie, Laramie Longhorn, and the Limited. There are three different engine options in the 1500 range, starting with the 3.6-liter V-6 24-valve VVT eTorque engine upgrade 1. This option is standard in the Tradesman, Rebel, and Big Horn/Lone Star. These models also make use of the 8-speed automatic 850RE transmission. The 5.7-liter V-8 HEMI MDS VVT engine is standard in the Laramie, Laramie Longhorn, and the Limited and for those, drivers can rely on the 8-speed automatic 8HP75 transmission. Drivers also have the chance of opting for the 5.7-liter V-8 HEMI MDS VVT eTorque engine. According to Ram, drivers can expect up to 395 horsepower from all trims in the range with the correct configuration. The Ram pushes out sheer power, however, and this means haulage and carting around heavy loads. The 2,100-pound payload is ideal for tough work situations and the Tradesman has an impressive hauling power of up to 12,750 pounds. Those who happen to choose the Laramie Longhorn or Limited trim will be spoiled with a luxurious leather and wood interior. These trims combine the luxury with a futuristic 12-inch touchscreen that allows the driver easy access to controls and navigation options. The other trims have the 5-inch and 8.4-inch screens as standard. The Limited also boasts an impressive 19-speaker Harman Kardon sound system. All of the trims have the panoramic sunroof as an optional extra and the vehicle information center is standard across the board. Uconnect, Apple CarPlay, and Android Auto are also some of the interior features to look forward to. Ram spares no expense in ensuring that the best safety features are available in the 1500 range. These include the carefully placed airbags that deploy in the event of a collision and the blind spot monitoring with rear cross path and trailer detection. Those who need to enter their truck in high-risk areas can rely on the remote keyless entry to get in quickly and without having to look for their keys. For those who need to take on the open road with a heavy payload or tow, the electronic stability control and roll mitigation come in very handy. 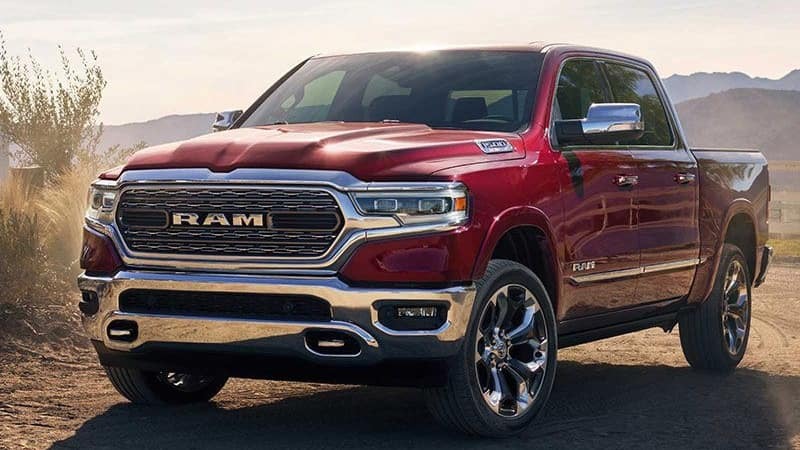 Now that you’ve gotten acquainted with the 2019 Ram 1500, discover it for yourself. Just schedule a test drive. * 8 Cylinder engine * * Check out this 2019 RAM 1500 Big Horn * * 2019 ** RAM * * 1500 * This Red 2019 RAM 1500 Big Horn might be just the crew cab for you. It comes with a 8 Cylinder engine. Exhibiting a charming red exterior and a black interior, this vehicle won't be on the market for long. Interested? Call today to take this vehicle for a spin! Call Josh Tharp at 317-839-6554 for more information or to start your EAZY DEAL at Westgate By submitting an inquiry on this vehicle you are agreeing and consenting to our dealership contacting you by telephone, text messaging or other means concerning your inquiry, potential vehicle sale or promotional offerings by our dealership and other information. By participating, you consent to receive recurring text messages sent through an automatic telephone dialing system. Message and data rates m. Contact Information: Westgate Chrysler, 2695 East Main Street, Plainfield, IN, 46168, Phone: (317) 839-6554, E-mail: jtharp@westgateauto.com. 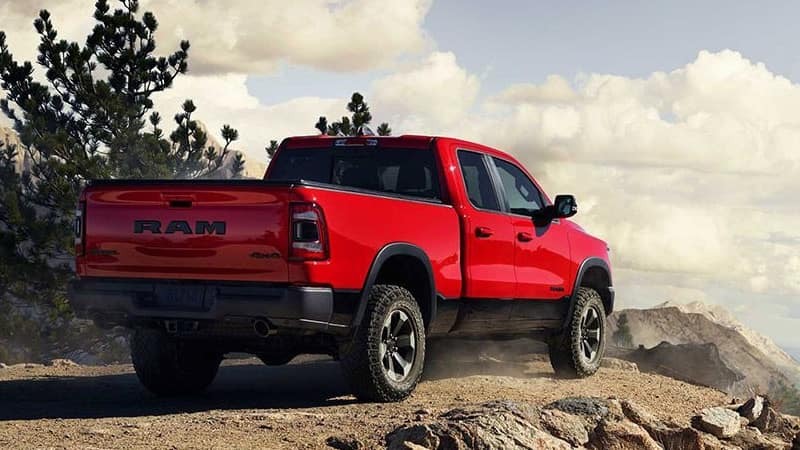 * 6 Cylinder engine * * Check out this 2019 RAM 1500 Big Horn * * 2019 ** RAM * * 1500 * This Red 2019 RAM 1500 Big Horn might be just the crew cab 4x4 for you. It has a 6 Cylinder engine. Flaunting a gorgeous red exterior and a black interior, this car is a sight to see from the inside out. Don't regret waiting on this one! Call today to schedule your test drive. Call Josh Tharp at 317-839-6554 for more information or to start your EAZY DEAL at Westgate By submitting an inquiry on this vehicle you are agreeing and consenting to our dealership contacting you by telephone, text messaging or other means concerning your inquiry, potential vehicle sale or promotional offerings by our dealership and other information. By participating, you consent to receive recurring text messages sent through an automatic telephone dialing system. Message and data rates m. Contact Information: Westgate Chrysler, 2695 East Main Street, Plainfield, IN, 46168, Phone: (317) 839-6554, E-mail: jtharp@westgateauto.com. * 6 Cylinder engine * * Check out this 2019 RAM 1500 Big Horn * * 2019 ** RAM * * 1500 * This Billet Silver Metallic 2019 RAM 1500 Big Horn might be just the crew cab 4x4 for you. It has a 6 Cylinder engine. Drivers love the timeless billet silver metall exterior with a black interior. Interested? Call today to take this vehicle for a spin! Call Josh Tharp at 317-839-6554 for more information or to start your EAZY DEAL at Westgate By submitting an inquiry on this vehicle you are agreeing and consenting to our dealership contacting you by telephone, text messaging or other means concerning your inquiry, potential vehicle sale or promotional offerings by our dealership and other information. By participating, you consent to receive recurring text messages sent through an automatic telephone dialing system. Message and data rates m. Contact Information: Westgate Chrysler, 2695 East Main Street, Plainfield, IN, 46168, Phone: (317) 839-6554, E-mail: jtharp@westgateauto.com. * 6 Cylinder engine * * Check out this 2019 RAM 1500 Big Horn * * 2019 ** RAM * * 1500 * This Red 2019 RAM 1500 Big Horn might be just the crew cab 4x4 for you. It comes with a 6 Cylinder engine. Flaunting a timeless red exterior and a black interior, this car is a sight to see from the inside out. Make your move before it's too late schedule a test drive today! Call Josh Tharp at 317-839-6554 for more information or to start your EAZY DEAL at Westgate By submitting an inquiry on this vehicle you are agreeing and consenting to our dealership contacting you by telephone, text messaging or other means concerning your inquiry, potential vehicle sale or promotional offerings by our dealership and other information. By participating, you consent to receive recurring text messages sent through an automatic telephone dialing system. Message and data rates m. Contact Information: Westgate Chrysler, 2695 East Main Street, Plainfield, IN, 46168, Phone: (317) 839-6554, E-mail: jtharp@westgateauto.com. * 6 Cylinder engine * * Check out this 2019 RAM 1500 Big Horn * * 2019 ** RAM * * 1500 * This Diamond Black 2019 RAM 1500 Big Horn might be just the crew cab 4x4 for you. It comes with a 6 Cylinder engine. Rocking a ravishing diamond black exterior and a black interior, this car is a sight to see from the inside out. View this beauty and our entire inventory today! Call for more details. Call Josh Tharp at 317-839-6554 for more information or to start your EAZY DEAL at Westgate By submitting an inquiry on this vehicle you are agreeing and consenting to our dealership contacting you by telephone, text messaging or other means concerning your inquiry, potential vehicle sale or promotional offerings by our dealership and other information. By participating, you consent to receive recurring text messages sent through an automatic telephone dialing system. Message and data rates m. Contact Information: Westgate Chrysler, 2695 East Main Street, Plainfield, IN, 46168, Phone: (317) 839-6554, E-mail: jtharp@westgateauto.com. * 8 Cylinder engine * * Check out this 2019 RAM 1500 Big Horn * * 2019 ** RAM * * 1500 * This Crystal Metallic 2019 RAM 1500 Big Horn might be just the crew cab 4x4 for you. It has a 8 Cylinder engine. Flaunting a stunning crystal metallic exterior and a black interior, this car is a sight to see from the inside out. Don't wait on this one. Schedule a test drive today! Call Josh Tharp at 317-839-6554 for more information or to start your EAZY DEAL at Westgate By submitting an inquiry on this vehicle you are agreeing and consenting to our dealership contacting you by telephone, text messaging or other means concerning your inquiry, potential vehicle sale or promotional offerings by our dealership and other information. By participating, you consent to receive recurring text messages sent through an automatic telephone dialing system. Message and data rates m. Contact Information: Westgate Chrysler, 2695 East Main Street, Plainfield, IN, 46168, Phone: (317) 839-6554, E-mail: jtharp@westgateauto.com. * 8 Cylinder engine * * Check out this 2019 RAM 1500 Tradesman * * 2019 ** RAM * * 1500 * This Bright White Clearcoat 2019 RAM 1500 Tradesman might be just the crew cab 4x4 for you. It has a 8 Cylinder engine. Exhibiting a timeless bright white clearco exterior and a black interior, this vehicle won't be on the market for long. Make your move before it's too late schedule a test drive today! Call Josh Tharp at 317-839-6554 for more information or to start your EAZY DEAL at Westgate By submitting an inquiry on this vehicle you are agreeing and consenting to our dealership contacting you by telephone, text messaging or other means concerning your inquiry, potential vehicle sale or promotional offerings by our dealership and other information. By participating, you consent to receive recurring text messages sent through an automatic telephone dialing system. Message and data rates m. Contact Information: Westgate Chrysler, 2695 East Main Street, Plainfield, IN, 46168, Phone: (317) 839-6554, E-mail: jtharp@westgateauto.com. * 8 Cylinder engine * * Check out this 2019 RAM 1500 Big Horn * * 2019 ** RAM * * 1500 * This Blue Streak 2019 RAM 1500 Big Horn might be just the crew cab 4x4 for you. It comes with a 8 Cylinder engine. Flaunting a classic blue streak exterior and a black interior, this car is a sight to see from the inside out. Interested? Call today and schedule a test drive! Call Josh Tharp at 317-839-6554 for more information or to start your EAZY DEAL at Westgate By submitting an inquiry on this vehicle you are agreeing and consenting to our dealership contacting you by telephone, text messaging or other means concerning your inquiry, potential vehicle sale or promotional offerings by our dealership and other information. By participating, you consent to receive recurring text messages sent through an automatic telephone dialing system. Message and data rates m. Contact Information: Westgate Chrysler, 2695 East Main Street, Plainfield, IN, 46168, Phone: (317) 839-6554, E-mail: jtharp@westgateauto.com. 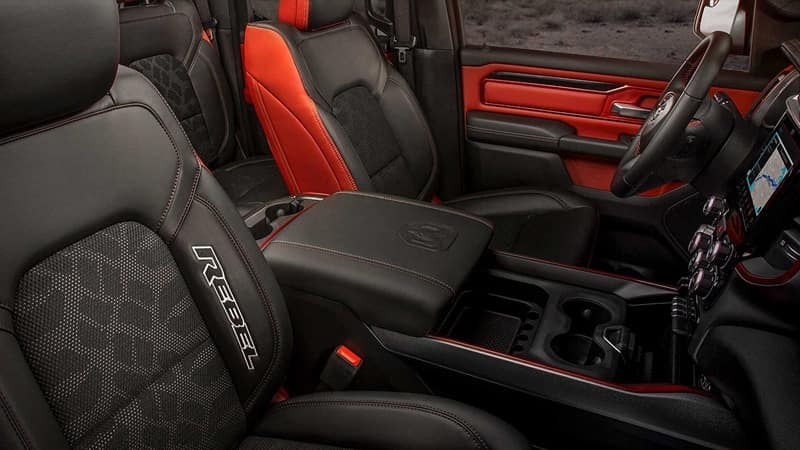 * 8 Cylinder engine * * Check out this 2019 RAM 1500 Big Horn * * 2019 ** RAM * * 1500 * This Red 2019 RAM 1500 Big Horn might be just the crew cab 4x4 for you. It has a 8 Cylinder engine. Rocking a sharp red exterior and a black interior, this car is a sight to see from the inside out. View this beauty and our entire inventory today! Call for more details. Call Josh Tharp at 317-839-6554 for more information or to start your EAZY DEAL at Westgate By submitting an inquiry on this vehicle you are agreeing and consenting to our dealership contacting you by telephone, text messaging or other means concerning your inquiry, potential vehicle sale or promotional offerings by our dealership and other information. By participating, you consent to receive recurring text messages sent through an automatic telephone dialing system. Message and data rates m. Contact Information: Westgate Chrysler, 2695 East Main Street, Plainfield, IN, 46168, Phone: (317) 839-6554, E-mail: jtharp@westgateauto.com. * 8 Cylinder engine * * Check out this 2019 RAM 1500 Big Horn * * 2019 ** RAM * * 1500 * This Flame Red Clearcoat 2019 RAM 1500 Big Horn might be just the crew cab 4x4 for you. It comes with a 8 Cylinder engine. Flaunting a stunning flame red clearcoat exterior and a black interior, this car is a sight to see from the inside out. Call today to schedule your test drive! Call Josh Tharp at 317-839-6554 for more information or to start your EAZY DEAL at Westgate By submitting an inquiry on this vehicle you are agreeing and consenting to our dealership contacting you by telephone, text messaging or other means concerning your inquiry, potential vehicle sale or promotional offerings by our dealership and other information. By participating, you consent to receive recurring text messages sent through an automatic telephone dialing system. Message and data rates m. Contact Information: Westgate Chrysler, 2695 East Main Street, Plainfield, IN, 46168, Phone: (317) 839-6554, E-mail: jtharp@westgateauto.com. * 8 Cylinder engine * * Check out this 2019 RAM 1500 Big Horn * * 2019 ** RAM * * 1500 * This Flame Red Clearcoat 2019 RAM 1500 Big Horn might be just the crew cab 4x4 for you. It comes with a 8 Cylinder engine. With a gorgeous flame red clearcoat exterior and a black interior, this vehicle is a top pick. Don't sit on this decision for long...schedule your test drive today! Call Josh Tharp at 317-839-6554 for more information or to start your EAZY DEAL at Westgate By submitting an inquiry on this vehicle you are agreeing and consenting to our dealership contacting you by telephone, text messaging or other means concerning your inquiry, potential vehicle sale or promotional offerings by our dealership and other information. By participating, you consent to receive recurring text messages sent through an automatic telephone dialing system. Message and data rates m. Contact Information: Westgate Chrysler, 2695 East Main Street, Plainfield, IN, 46168, Phone: (317) 839-6554, E-mail: jtharp@westgateauto.com. * 8 Cylinder engine * * Check out this 2019 RAM 1500 Big Horn * * 2019 ** RAM * * 1500 * This Crystal Metallic 2019 RAM 1500 Big Horn might be just the crew cab 4x4 for you. It has a 8 Cylinder engine. Rocking a suave crystal metallic exterior and a black interior, this car is a sight to see from the inside out. Make your move before it's too late schedule a test drive today! Call Josh Tharp at 317-839-6554 for more information or to start your EAZY DEAL at Westgate By submitting an inquiry on this vehicle you are agreeing and consenting to our dealership contacting you by telephone, text messaging or other means concerning your inquiry, potential vehicle sale or promotional offerings by our dealership and other information. By participating, you consent to receive recurring text messages sent through an automatic telephone dialing system. Message and data rates m. Contact Information: Westgate Chrysler, 2695 East Main Street, Plainfield, IN, 46168, Phone: (317) 839-6554, E-mail: jtharp@westgateauto.com. * 8 Cylinder engine * * Check out this 2019 RAM 1500 Big Horn * * 2019 ** RAM * * 1500 * This Bright White Clearcoat 2019 RAM 1500 Big Horn might be just the quad cab 4x4 for you. It comes with a 8 Cylinder engine. Rocking a gorgeous bright white clearco exterior and a black interior, this car is a great pick. Call today to test it out! Call Josh Tharp at 317-839-6554 for more information or to start your EAZY DEAL at Westgate By submitting an inquiry on this vehicle you are agreeing and consenting to our dealership contacting you by telephone, text messaging or other means concerning your inquiry, potential vehicle sale or promotional offerings by our dealership and other information. By participating, you consent to receive recurring text messages sent through an automatic telephone dialing system. Message and data rates m. Contact Information: Westgate Chrysler, 2695 East Main Street, Plainfield, IN, 46168, Phone: (317) 839-6554, E-mail: jtharp@westgateauto.com. * 8 Cylinder engine * * Check out this 2019 RAM 1500 Big Horn * * 2019 ** RAM * * 1500 * This Blue Streak 2019 RAM 1500 Big Horn might be just the crew cab 4x4 for you. It comes with a 8 Cylinder engine. Flaunting a sleek blue streak exterior and a black interior. Come see us today and see this one in person! Call Josh Tharp at 317-839-6554 for more information or to start your EAZY DEAL at Westgate By submitting an inquiry on this vehicle you are agreeing and consenting to our dealership contacting you by telephone, text messaging or other means concerning your inquiry, potential vehicle sale or promotional offerings by our dealership and other information. By participating, you consent to receive recurring text messages sent through an automatic telephone dialing system. Message and data rates m. Contact Information: Westgate Chrysler, 2695 East Main Street, Plainfield, IN, 46168, Phone: (317) 839-6554, E-mail: jtharp@westgateauto.com. * 8 Cylinder engine * * Check out this 2019 RAM 1500 Big Horn * * 2019 ** RAM * * 1500 * This Crystal Metallic 2019 RAM 1500 Big Horn might be just the crew cab 4x4 for you. It has a 8 Cylinder engine. With a timeless crystal metallic exterior and a black interior, this vehicle is a top pick. Call today to test it out! Call Josh Tharp at 317-839-6554 for more information or to start your EAZY DEAL at Westgate By submitting an inquiry on this vehicle you are agreeing and consenting to our dealership contacting you by telephone, text messaging or other means concerning your inquiry, potential vehicle sale or promotional offerings by our dealership and other information. By participating, you consent to receive recurring text messages sent through an automatic telephone dialing system. Message and data rates m. Contact Information: Westgate Chrysler, 2695 East Main Street, Plainfield, IN, 46168, Phone: (317) 839-6554, E-mail: jtharp@westgateauto.com. * 8 Cylinder engine * * Check out this 2019 RAM 1500 Big Horn * * 2019 ** RAM * * 1500 * This Bright White Clearcoat 2019 RAM 1500 Big Horn might be just the crew cab 4x4 for you. It comes with a 8 Cylinder engine. With a ravishing bright white clearco exterior and a black interior, this vehicle is a top pick. Interested? Call today and take it for a spin! Call Josh Tharp at 317-839-6554 for more information or to start your EAZY DEAL at Westgate By submitting an inquiry on this vehicle you are agreeing and consenting to our dealership contacting you by telephone, text messaging or other means concerning your inquiry, potential vehicle sale or promotional offerings by our dealership and other information. By participating, you consent to receive recurring text messages sent through an automatic telephone dialing system. Message and data rates m. Contact Information: Westgate Chrysler, 2695 East Main Street, Plainfield, IN, 46168, Phone: (317) 839-6554, E-mail: jtharp@westgateauto.com. * 8 Cylinder engine * * Check out this 2019 RAM 1500 Big Horn * * 2019 ** RAM * * 1500 * This Bright White Clearcoat 2019 RAM 1500 Big Horn might be just the crew cab 4x4 for you. It comes with a 8 Cylinder engine. Complete with a ravishing bright white clearco exterior and a black interior, this vehicle is in high demand. Interested? Call today and schedule a test drive! Call Josh Tharp at 317-839-6554 for more information or to start your EAZY DEAL at Westgate By submitting an inquiry on this vehicle you are agreeing and consenting to our dealership contacting you by telephone, text messaging or other means concerning your inquiry, potential vehicle sale or promotional offerings by our dealership and other information. By participating, you consent to receive recurring text messages sent through an automatic telephone dialing system. Message and data rates m. Contact Information: Westgate Chrysler, 2695 East Main Street, Plainfield, IN, 46168, Phone: (317) 839-6554, E-mail: jtharp@westgateauto.com. * 8 Cylinder engine * * Check out this 2019 RAM 1500 Big Horn * * 2019 ** RAM * * 1500 * This Red 2019 RAM 1500 Big Horn might be just the crew cab 4x4 for you. It comes with a 8 Cylinder engine. Flaunting a gorgeous red exterior and a black interior, this car is a sight to see from the inside out. Call today and take this one out for a spin! Call Josh Tharp at 317-839-6554 for more information or to start your EAZY DEAL at Westgate By submitting an inquiry on this vehicle you are agreeing and consenting to our dealership contacting you by telephone, text messaging or other means concerning your inquiry, potential vehicle sale or promotional offerings by our dealership and other information. By participating, you consent to receive recurring text messages sent through an automatic telephone dialing system. Message and data rates m. Contact Information: Westgate Chrysler, 2695 East Main Street, Plainfield, IN, 46168, Phone: (317) 839-6554, E-mail: jtharp@westgateauto.com.